AMJ Comms | An island among the six; my Ireland. Christmas is class. Easter is excellent. And the summer holidays are superb. But there is a annual event – a festival – that stands out for me every year. It is my favourite time in the calendar; a celebration of the finest sport and even finer sportsmanship anywhere on the planet. It stands head and shoulders above its rivals – it never disappoints – it never falls flat. It is the Six Nations. Six weeks that mark the start of the spring, that lead us into the optimistic, brighter days or March with a smile and bounce in the step and culminate around St Patrick’s Day with a proud patriotism but an even prouder sense of belonging to someone larger than one country or one flag. The Six Nations provides an annual opportunity to express a passion for your country, your anthems, your love of place without anger, hate, vitriol or ugliness. The example from the pitch is carried into the stands, bars and homes of these islands and across The Channel. It is a spectacular time to be a citizen of these six great nations. For me, the Six Nations is also a wonderful opportunity to celebrate the great complexity and ambiguity of identity. Long before I knew the full history of my family I was always drawn to the stunning, passionate island just 130 miles of so from my birthplace. Attracted as I have always been to the people; the music; the written word; the symbols; the character; the history; the conflicts and questions, it was a sense of realising a destiny when I received my citizenship and then my passport. But I was Irish a long time before I had the pieces of paper to prove it. Mine was not the usual plastic paddy syndrome that we do a great line in, here in Liverpool. It wasn’t the “more Irish than the Irish” upbringing, with rebel songs played at home and family holidays to Donegal. It is true that one of my earliest childhood memories is of my paternal grandfather arriving home on Sunday from Mass and the church club to speak to me in his incomprehensible accent and listen at his knee whilst he played unfamiliar music on a wooden-looking music system. But this connection to Ireland – to his birthplace of Wexford – was never encouraged or really discussed. Not even with a name like Redmond – so prized in that part of the isle. It was many, many years later when I started to realise that I had a deep love for the country and its people – many of my friends and those I was drawn to hailed from north, south, east and west of the free state and its occupied partner. The biggest influence on me at this time was a great man from Wigan, whose own Irish story was similar to mine. He introduced me to Joyce, the craic, the songs that still fill my “recently played” list and the character, personality and outlook that prompted laughs, tears and philosophical reflections in equal measure. Himself. Mr Michael Gallagher. A man who in all his joyous contradictions and complexities summed up the wonderful country to which I belong. It was therefore no surprise that when I met my best friend, my soulmate, my life partner, she was an Irishwoman. A wonderful, beautiful, super smart Flower of Sweet Strabane. One for whom the complexity of the north-south divide and the sense of herself was second nature and no problem. Her extraordinary family have always accepted me – not just for me – but as one of them, despite at that time being a Tory parliamentary a candidate! So that brings me to today. 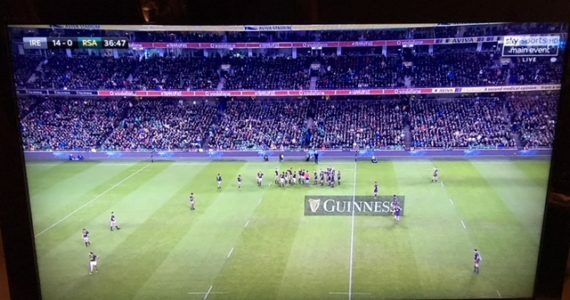 Ireland vs England in Dublin. A flashback to that unforgettable day 12 years ago when – surrounded by great friends and half of London’s Irish population – we sang our songs and theirs as the English entered Croke Park. Tears streaming down mine and many other cheeks. The weight of history and the complexity that people like me epitomise dealt with in a few minutes of classy, good grace. That’s the Six Nations. Polite. Friendly. Respectful. Decent. Proud. Passionate. Special. Team Jones will sit together today and watch our boys take the field – green shirts on our back. Helping Aoife understand the importance of being Irish but the equal importance of loving thy neighbour. Brexit or no Brexit. Win. Lose. Or draw.